Insomniac Games has had a weird recent history. The studio was exclusive to Sony for a long time, producing the likes of Ratchet & Clank and the Resistance series. It then went multiplatform a few years back and released Fuse, a game once known as Overstrike that somehow devolved into a generic shooter in spite of its roots and debut. 10 years ago, I don't think fans would have guessed that the makers of Ratchet and Resistance would be releasing an Xbox title that wasn't set to be sold on any other platform. They are. That game is Sunset Overdrive, and it absolutely makes up for whatever happened with Fuse. 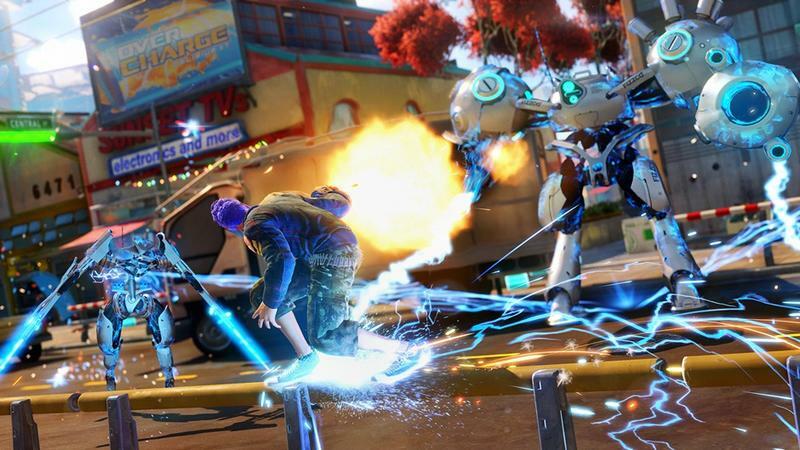 With Sunset Overdrive, fans of Insomniac Games and Microsoft are hoping for an Xbox One exclusive that delivers on their flare for brilliant weaponry, a world of dynamic vibrancy and a title that's built to move consoles. 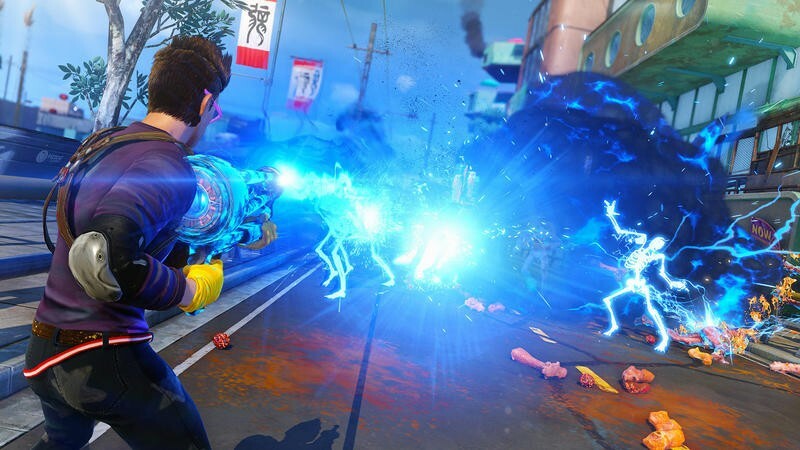 While I contend that this isn't Insomniac's best work, Sunset Overdrive is a game that Xbox One owners absolutely must have and that Insomniac fans can be proud of. It's pure fun. From the moment you boot up the game until you see the credits roll (and the subsequent exploration that will surely follow), you will need to embrace silliness. Sunset Overdrive has it in spades. 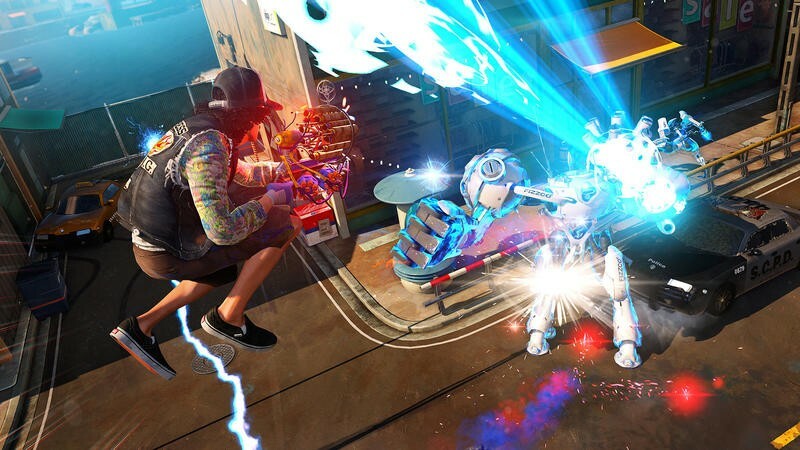 Whether it's fourth wall breaking references, absurd respawn animations or impossibly stupid boss fights (in a good way), Sunset Overdrive is packed with absurdity. While all those jokes might not make you laugh, they will constantly remind you that you're playing the game with the express purpose of having fun. That's all this thing was built for: fun. It exceeds when delivering that promise, too. I imagine that some gamers will likely find fault with the game's simplistic city and shallow storyline, but I propose instead that you consider both of those pieces as simply toys in the giant playground that is the game. 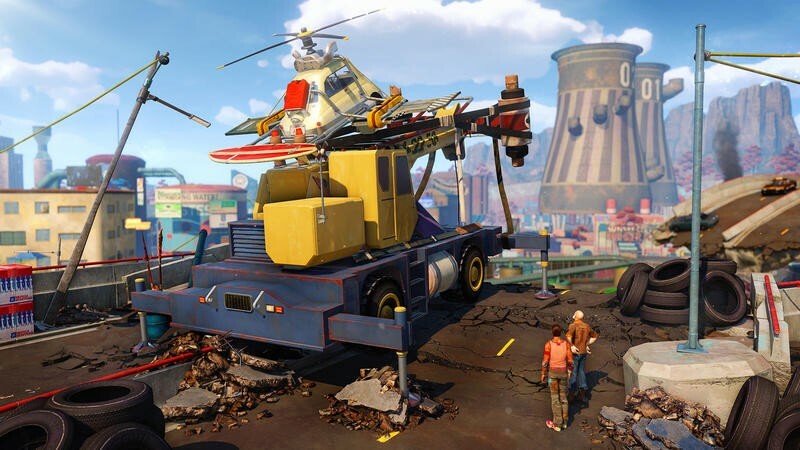 Sunset Overdrive doesn't offer the biggest city you've ever seen, its storyline won't win any awards, its characters are rather forgettable and doesn't offer the same hard hitting moments that you'd find in other banner titles. The playground that it provides, as this section of our review indicates, is one that's perfect for its goal. 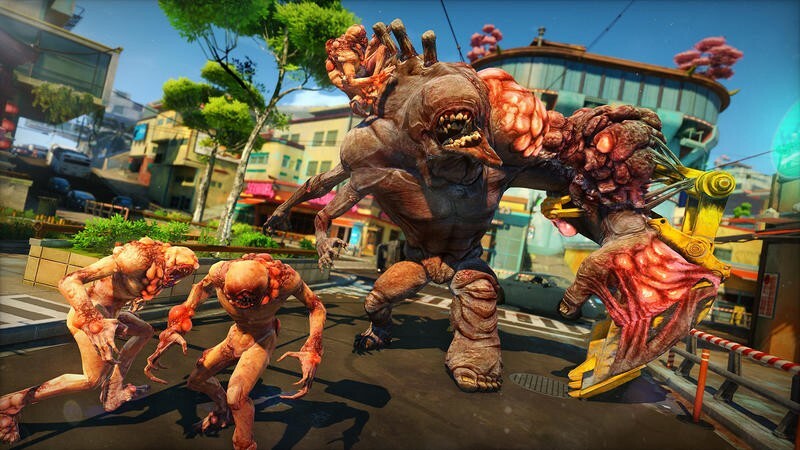 One of Sunset Overdrive's biggest selling points is traversal. 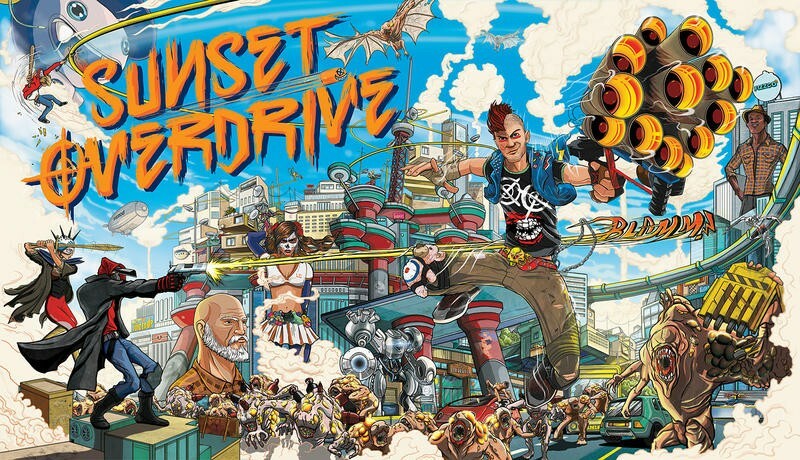 In an age where almost every single AAA game features a character capable of climbing any building or structure in sight, Sunset goes with a more horizontal and speedy route of movement. You can't really climb in this game. You may be able to grind your way to the top of a building or reach it by bouncing on surfaces or vaulting over specific ledges, but you won't be holding A while you push up to shimmy and shuffle up ledges and walls. Insomniac left that stuff to other titles, and instead we have a world that's traversed in ways not too dissimilar from Jet Set Radio, BioShock Infinite and Tony Hawk. You can grind on just about every single rail, power line and rooftop edge in this game. The power lines, actually, serve as double-sided affairs that let you either grind on top or hang from below (similar to BioShock Infinite's skyhook system. When you're not grinding, you're probably bouncing. Cars, hot dog vendors, canopies, skylights and other obviously marked spots produce a huge amount of air when you land on them (you earn an ability that lets you increase those jumps with the press of a button early on in the game, too). When you combine the grinding and bouncing in Sunset, you get the main way to move about every single space in the game. It's weird and tricky for, maybe, the first 30 minutes. But, once you master the basics of moving on these objects, it's easy to fly from one side of the map to the other at a moment's notice by stringing together the nearly infinite lines of rails and bouncy objects. Yes, the game even takes the words right out of your mouth and throws "The Floor is Lava" type challenges at you, where sometimes the floor literally is lava. You can move pretty much everywhere in the game without setting foot on the street, and that's encouraged by the game's weird combo system. Which, as it happens, works really well with battling enemies. Sweet segue, man! Bring Those Tricks to Battle! 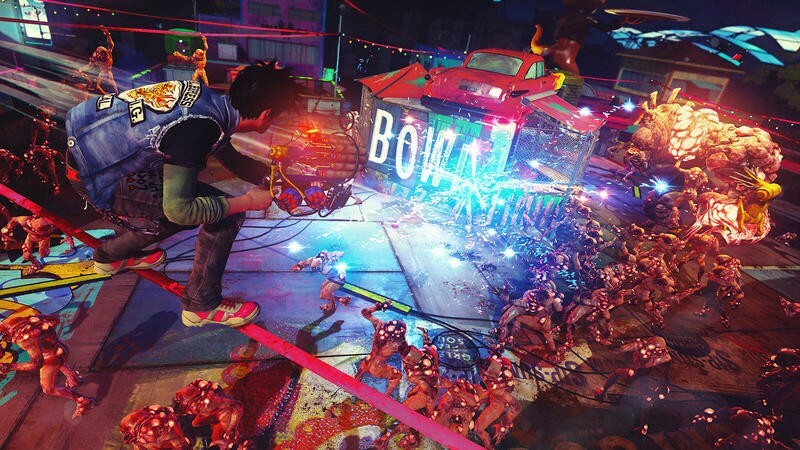 The storyline of Sunset Overdrive has it that a giant corporation (Fizzco) releases a brand new energy drink that's set to take the world by storm. As we quickly learn, that energy drink turns those who consume it into horrific, orange mutants with a thirst for murder and, well, more of the energy drink. These beasts are known as OD in the game. When you're not fighting them, you're either fighting Scabs (humans who go all Mad Max in this apocalypse) and Fizzco Robots sent to keep Sunset City in check. If this were any other open world third person shooter, you'd take these baddies on with nothing but the world around you to take cover behind. Well, good thing you can't even take cover in this game, because you'll want to take all of the crazy traversal stuff you read about in the section above and apply it to the world of battle. As you grind and bounce about a given space, you'll blast enemies with a host of insane weaponry. Remember how I mentioned that you'd want to string all that grinding and bouncing together in order to increase the style meter? Well, killing bad guys adds even more style to your score. At specific intervals in style growth, your character activates amps. Amps are a whole separate thing in this game. You earn the simple ones by collecting odds and ends in the city and turning them in. The more intense amps are earned with a defend the base type game that goes down at night. While your amps cook in overdrive, OD big and small charge in from all angles in order to steal your juice. You'll set up traps and grind about the base with your badass weapons in order to keep them at bay while your goodness cooks. With those amps in tow, you'll want to kill bad guys while grinding and bouncing without touching the ground in order to keep your style meter rising. When it reaches certain levels, it activates the amps. You'll be able to see fire rain down from the rails you grind, explosives fire out of the cars you bounce on, weapons take on new twists when you fire them, Grim Reapers pop out of the ground to murder those around you and a whole lot more. It's with these combat bonuses that Sunset manages to push you to master traversal. It's also with the swarming difficulty of the OD. If you stay on the ground, whether you're running or staying still, you will die. Don't do that. Move, shoot, stay alive. If Insomniac is known for anything, it's their penchant for crazy weapons. 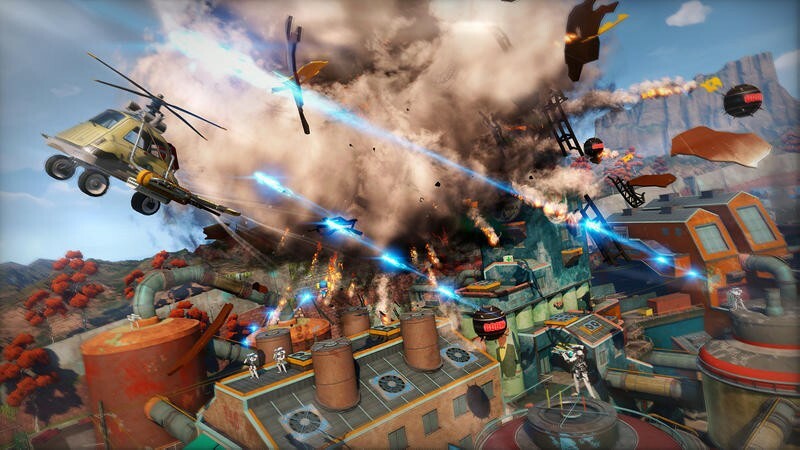 Dating back to the impeccable Ratchet & Clank franchise, these developers know how to make silly and rewarding guns, launchers and drones. 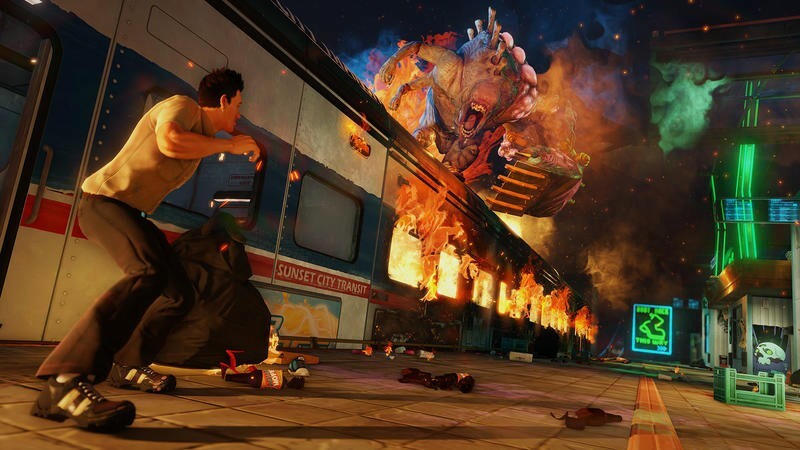 That continues with Sunset Overdrive, and the host of weapons here are some of the best the developer has assembled in a long time. There's a grenade launcher that fires teddy bears, a machine gun that shoots vinyl records capable of bouncing and chaining, a gun called The Dude that fires, of course, bowling balls and a whole lot more. Each gun will upgrade as you use it, reaching new levels of damage. You can also apply some earned amps to these guns that will even further augment the weapons. 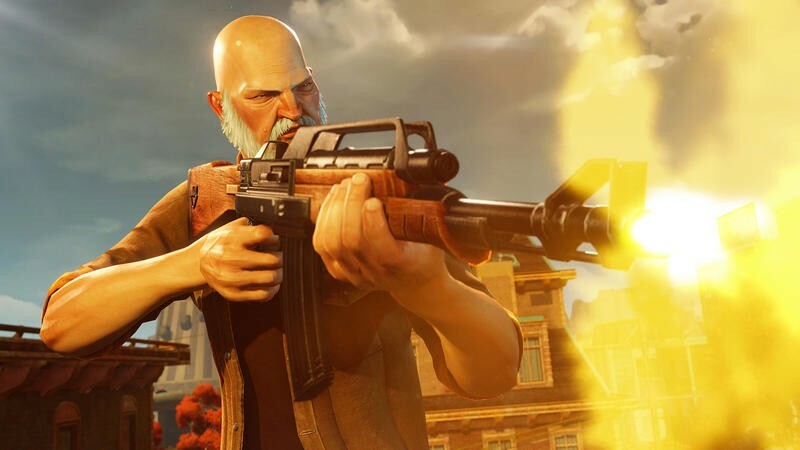 Maybe you want enemies hit with the flame-firing shotgun to explode into a series of crazy launching rockets. That can happen. What you wind up with here is a game that has an incredibly fun mode of traversal teeming with interesting enemies, solid combo and upgrade systems and weapons that are actually fun to develop. That's the winning recipe here, and it lets the hours of play slip by even faster than they already do. Which brings me to the downside. Sunset Overdrive is a blast. It's also rather short for an open world game. I stuck mostly to the main line of quests on my initial play and found that it took me only six hours to beat. I'm used to other games in the same genre reaching 15 and 20 hours for just the standard campaign, but this one was done fast. There are side quests, though. The only problem is that they amount to speed runs through set routes or fetch and destroy quests for one or two random faction members at each base uncovered. These sidequests rarely vary from those presets, and thus they aren't really all that fun to complete. In a game that's so flawlessly built on fun, I found that to be rather depressing. The multiplayer, dubbed Chaos Squad, is one that I imagine is a ton of fun with friends. With Internet randoms who don't talk to one another, though, it's sort of a snooze fest. Chaos Squad can be hopped into by activating one of several specific booths within the open world of Sunset City. Once matched up with up to eight players, you'll embark on a string of voted open mini-games. Those might involve killing OD in a specific place for points, fighting a convoy of Fizzco bots or a twist on the aforementioned world filled with lava. Depending on your success here, your traps and strength in the Chaos Squad's base defense mode will fluctuate. You'll take those mini-game partners into a base defense arena, exactly like the ones you defended while cooking amps, and you'll fight back waves of OD for several minutes. The OD here are insanely difficult compared to the ones in the campaign, and that makes Chaos Squad tough with random players. Which brings me to my point about playing with friends. If you have partners in arms willing to battle back these mutants for sweet, sweet rewards, then you'll likely have a lot of fun here. Otherwise, the multiplayer really won't add much to a package that's sadly too slim. 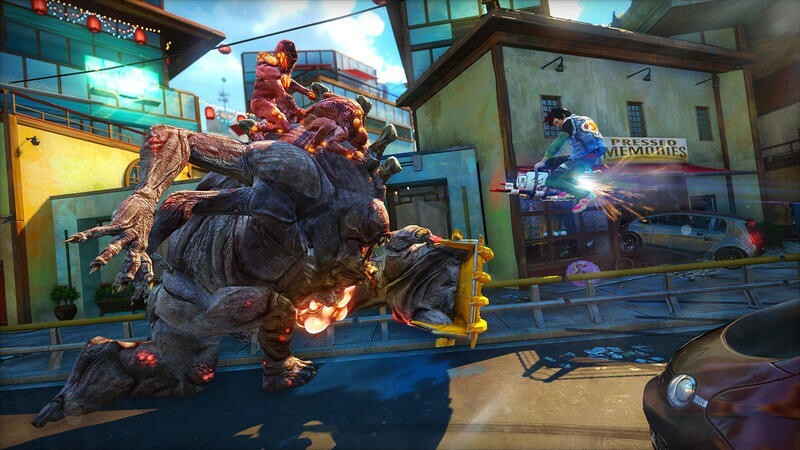 Sunset Overdrive is a must-have for Xbox One owners. I'm not really willing to dub this game a system-seller. 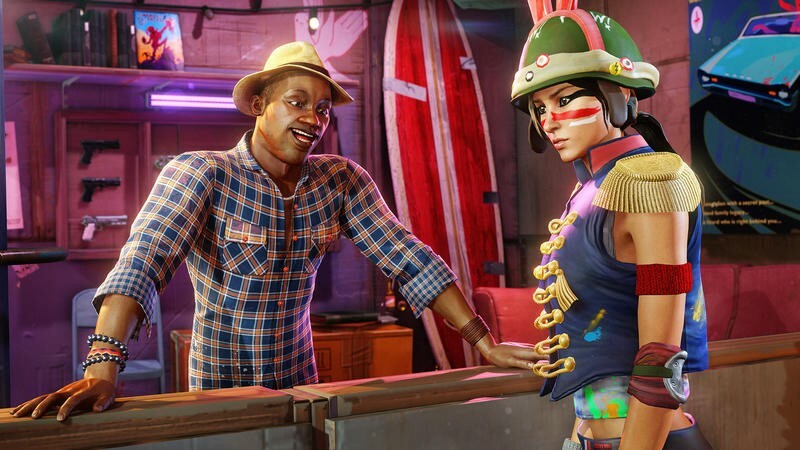 If it were longer (like, double or triple in length) or the sidequests offered more diversity, Sunset Overdrive would likely be the first undeniable reason to run out and buy an Xbox One. As it is now, this single game shouldn't push you to pick up a console. It is, however, a game that Xbox One owners shouldn't skip. If you own Microsoft's console, I'd argue that this is one of its best exclusives of the holiday season. 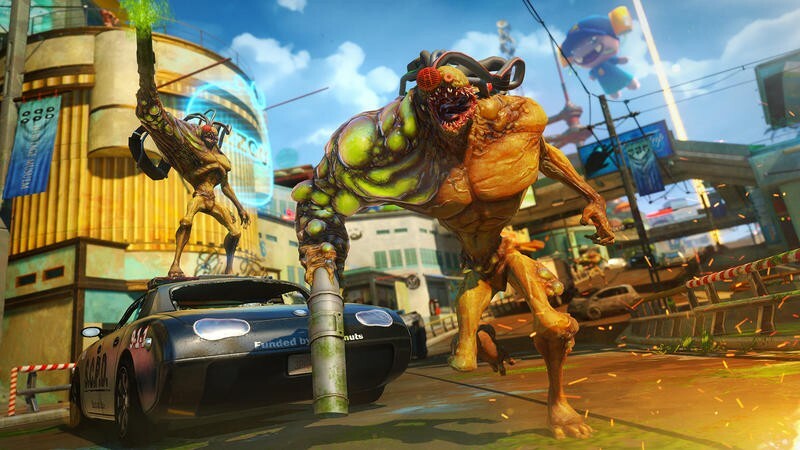 Sunset Overdrive is fun, stylistic, funny and addictive. It's pure gaming bliss, and you should have it. But, man, that length. Maybe I'm too used to enjoying games that clock in at 12, 15, 20 or 30 hours, but I can't even really express the disappointment I felt after my first campaign run clocked in around six and a half hours played. If you can dig into the multiplayer, don't mind the tedium of the sidequests and can excuse the brevity of the campaign, this probably won't be a sore spot for you. Otherwise, turn this "Buy" into a "Wait" and hope for a price drop. 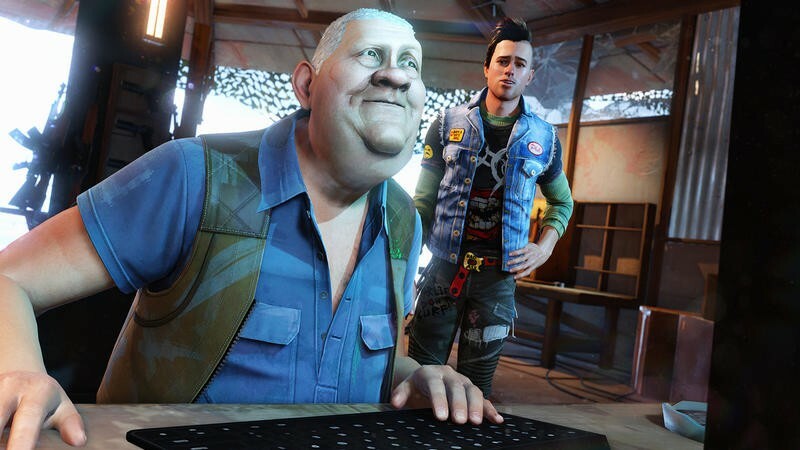 Disclaimer: We received a code to download and review Sunset Overdrive directly from Microsoft. We beat the game once, restarted it again and played its multiplayer over several sessions before starting this review.